Northwestern University in Illinois offered a new course on go last semester. The course was designed to help students build number sense, understand math concepts, and practice mathematical thinking, and was offered through the Center for Talent Development. The course evolved from a joint research project set up in November, 2015, by Xinming Guo, founder of Go and Math Academy, and David Uttal, a professor of Psychology and Education at Northwestern University. Guo has been advocating go for years, integrating the game as a math manipulative in the classroom. Each year thousands of students in Chicago and its suburbs have opportunities to make their first contact with go. 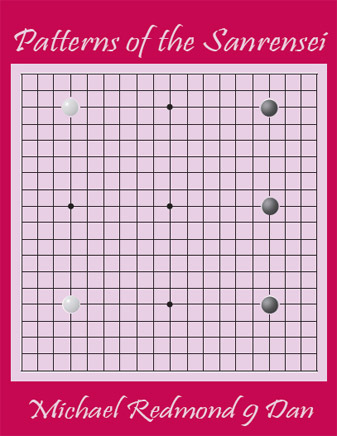 After a demonstration of go and its connections to math education, Professor Uttal suggested Guo develop a course on go and math for the CTD program at Northwestern University. 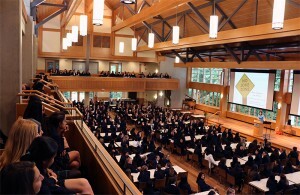 The new course was offered to students for the first time this past fall. Professor Uttal leads a research laboratory of undergraduate, graduate students, and post-docs investigating spatial cognition and STEM (Science Technology, Engineering and Math) education. With the help of Professor Uttal and his lab, the research now focuses not only on go and elementary math education, but also on go and spatial thinking. The project team is comprised of Professor Uttal, his doctoral student Yanning Yu, and Guo. “Once we have more research results, we are hopeful that a link can be established between go and fundamental cognitive skills of human beings,” says Guo. 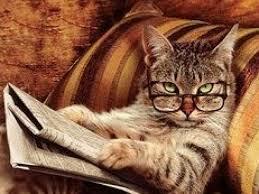 “The course and research have generated rich data so far. Doctoral student Yu and another research assistant, who recorded the entire 8-week course, have made many surprising discoveries after just a preliminary analysis,” says Guo. Deeper analysis is continuing and will provide more supporting materials for the 2nd phase of the research. “Go is a gold mine for future researches, no, a diamond mine,” said Professor Uttal. 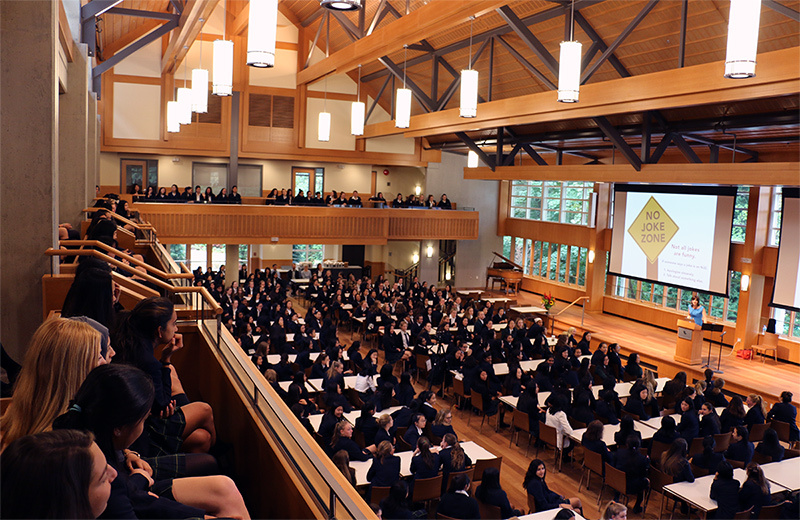 Guo shared his vision of bringing go to every school in his keynote speech at the US Go Congress in 2015. He continues to develop elementary go and math curricula to help students build solid math foundations, and also runs professional development seminars for teachers. “I hope that our research on the relationship between go and math can also make contributions to the history of go in the whole world,” said Guo. -Paul Barchilon, E-J Youth Editor. 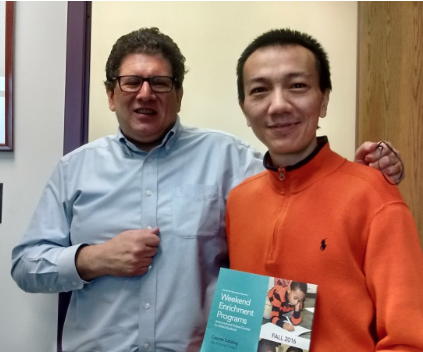 Photo by Xinming Guo: Professor Uttal (l) and Xinming Guo (r) with the Northwestern CTD Catalog, fall 2016, which lists their go course under the math category. Montreal Winter Cup – Saturday February 18th. Canadian Open – Vancouver, July 1st-3rd, at the Crofton House. The main tournament will be Saturday/Sunday, with Pair Go, playoffs, and possibly other side events Monday. “Reddit on their app download has a picture of the AlphaGo news,” reports Barry Physics. 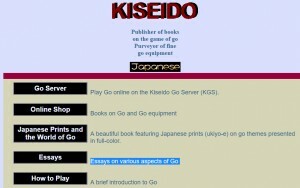 Kiseido’s recent website tech issues have been resolved, reports Richard Bozulich. 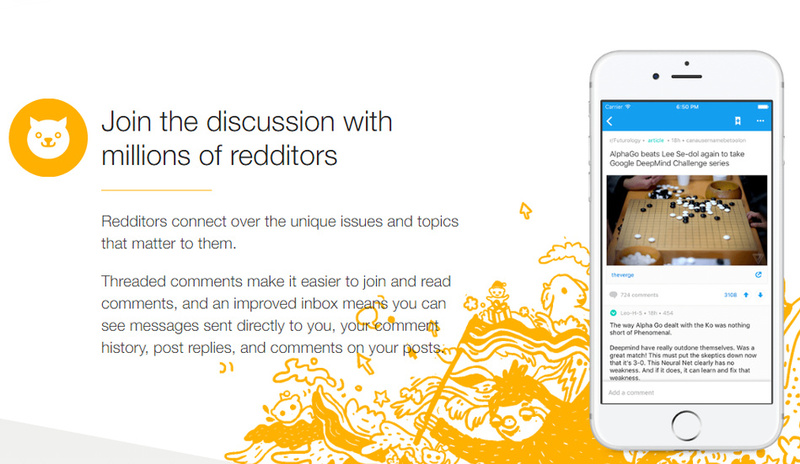 Click here to go to Kiseido’s new secure URL. 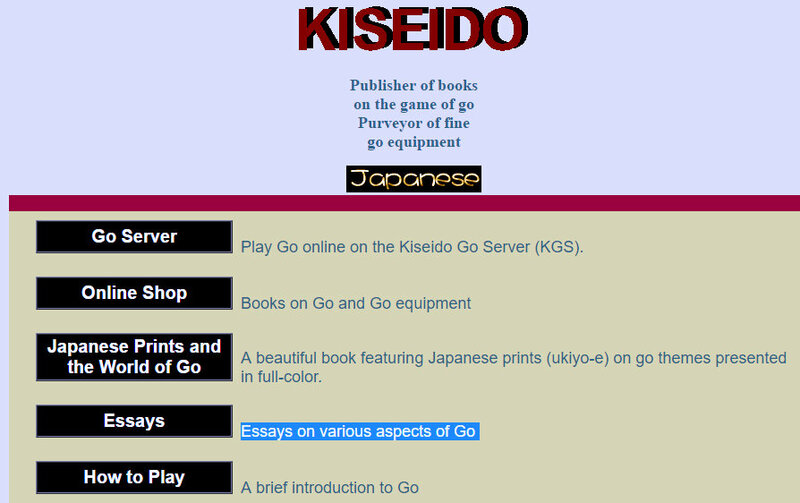 “In the meantime, until February 6, Kiseido is having a sale of all its books with with discounts of up to 15% and free shipping,” says Bozulich. The National Go Center has found a home in Washington DC with the signing of a 5-year lease on a space on Wisconsin Avenue, just two blocks from the Tenley Metro stop. 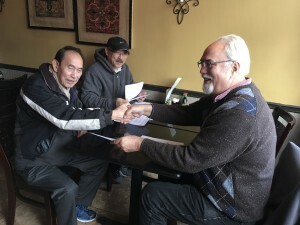 “We are very pleased to have found a great location to meet the needs of go players across the greater DC area,” said NGC Executive Director Gurujeet Khalsa. With 2900 square feet, Khalsa says “there’s plenty of space for a nice playing area and classrooms for teaching and after-school programs.” There are also lots of restaurants nearby, and off-street parking in addition to easily-accessible public transit. The second split of the Collegiate Go League (CGL) begins today. The CGL is a competitive league for college go clubs, now running for its sixth season. Fifteen universities from across the US and Canada are competing in the CGL’s regular season with 10 rounds and playoffs in April to determine the champion. After 5 rounds of competition, University of Maryland-College Park leads the A League, while Lafayette College leads the B League. Among the fierce competitors are former stars of the North American youth scene, such as Yunxuan Li 7d for Cornell University, Lionel Zhang 6d for UCLA, and Calvin Sun 1p for UC Berkeley. “Tune in on KGS to see your favorite players face off!” says Justin Teng. Click here for schedules and details. Sixty-seven percent “always” read the EJ and the top three most popular sections are game commentaries, news updates and reviews. Facebook is by far the most popular social media (62%), with Twitter at 27% and, significantly, nearly a quarter of our readership (23%) don’t use any social media at all. Slate & Shell, one of the main publishers and distributors of English-language go books, is having a winter sale from now until the 12th of February. New Moves by Alexander Dinerchtein, Patterns of the Sanrensei by Michael Redmond, and a handful of other books are all half off. On a separate note, Single Digit Kyu Game Commentaries and Young Chinese Go Masters, two previously out of print books from Slate & Shell, are now available on their Amazon page. Registration for the 2017 North American Kyu Championship (NAKC) closes on January 29th. Kyu players that are under the age of 18 and members of either the AGA, CGA, Gimnasio de Go, or MGA are eligible to compete across 5 divisions down to double-digit kyu in Junior (under 13) or Senior (under 18) sections for beautiful crystal trophies. In addition, players who participate in all 4 rounds are eligible for either a $200 scholarship to the 2017 US Go Congress in San Diego, CA, or a $400 to the 2017 AGA Summer Go Camp, courtesy of the American Go Foundation. The tournament will be held on KGS on February 4th; for official rules and format, click here. To register, click here. 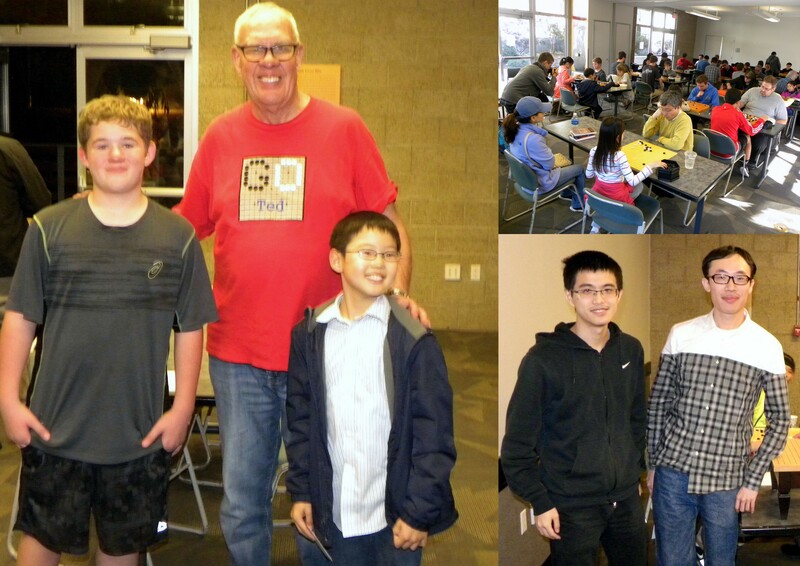 A record 47 players turned out for the 6th Annual San Diego Go Championship, held at UCSD on Saturday, January 14. The field ranged from 35-kyu beginners to 7-dan amateurs and from 6-year-olds to 70+ senior citizens. There were ten single-digit kyu players competing as well as more than ten new youth players, most of whom were new AGA members playing in their first go tournament. With 16 players contesting the Open section for dan-level players, Chengjie Huang (7-dan) won the Championship and the $100 first prize by going 3-0, beating two 6-dans and a 4-dan. The runner-up by tie-breakers, also with a 3-0 record, was UCSD go club president Jerry Cheng. Paul Margetts won the single-digit Kyu championship and the $50 first prize by going 3-0 while Kevin Steadman and Chester Liang both were undefeated in the double-digit Kyu section. In the youth division, Elias Klingbeil and Justin Lee tied with 3-0 records. A short unrated game was played to determine the champion and Justin won by 1.5 points. The tournament was a joint venture of the UCSD Go Club and the San Diego Go Club. Prizes and refreshments were provided by the Linda C. Terpstra State Farm Insurance Agency. The San Diego Go Club now turns its efforts to preparing for the 2017 US Go Congress, to be held August 5-12 at the Town and Country Resort; registration is expected to open soon.